Today is St. Patrick's Day. Whatever, blah. Erin go drink at home. This year I didn't hear nearly as much hype as usual, though. Perhaps I am going deaf to this holiday in old age? Or could it be that it is on a Wednesday? Anyway, I decided to celebrate in my own way. Two reviews of beers, neither green and one is actually brown, that have been around for several months and challenge the Best By and Drink By dates. Oh, I am sooooo dangerous! 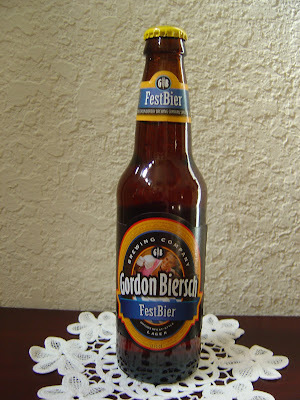 First tonight I'm drinking Gordon Biersch FestBier brewed by Gordon Biersch Brewing Company in San Jose, California. This will be my second beer from this brewery after enjoying their Blonde Bock back in November. Actually, that's not quite true. I downed eight or ten pints one rainy day a few years back at their brewpub in Atlanta, before heading down to catch my VERY delayed flight back to Miami. Let's just say I wasn't taking notes that day. Anyhow, the label says to "Never Trust a Skinny Brewer" and has a cute chick with big beers on it. Bottled on 07/06/09 so it's time to drink it. Nice fruity hops and toasted malty aroma. Bread and dough flavors to start, with mellow citrus and fruity apple flavors following close behind. Crisp, refreshing, simple, flavorful. Lightly tart, too. As the beer warmed, it got a little sweeter, but I liked this just fine. Memory and imagination make me want a few of these from the brewpub tap again. Oh, and "drink by" dates, whatever. Get some of this in any season! 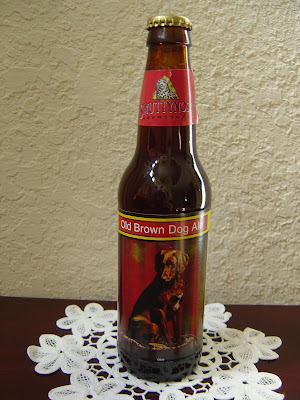 I am also drinking Old Brown Dog Ale brewed by Smuttynose Brewing Company in Portsmouth, New Hampshire. The label has a photograph of a beautiful brown dog named Olive. The dog doesn't look that old, though. Best before September, 2009. Not much of an aroma, malty with a little caramel. Flavors are much more pronounced. Lots and lots of chocolate flavors, and this beer is very smooth and creamy. Great balance between sweet and bitter. A small roasted nuttiness is in the background but is more of an accent. There is also just enough spiciness to add some variety here. Medium body, very drinkable. I'd recommend this any day as the flavors are really nice. Smuttynose is nice...not the best, but not bad. I had the Lagunitas Gnarly Wine the other night..hot damn, was that some good shizz!! Smuttynose has been hit or miss for me, but this one was pretty good. We don't get Gnarly Wine here, but I do think Lagunitas is a fabulous brewery. I had their New Dogtown Pale Ale a few days ago--try it--it's terrific!